Author: Dr. JinHyo Joseph Yun, principal researcher at the Convergence Research Center for Future Automotive Technology (Professor of Open Innovation Academemy of SOItmC www.openinnovaitontmc.org) , published ‘the Business Model Design Compass’ by the Springer, German publishing company. In the book, Dr. Yun explored the open relationship between technology and markets and established a crucial link between them. It takes a systematic approach to describe the relationship between technology and market, focusing on how to develop and maintain successful business models. 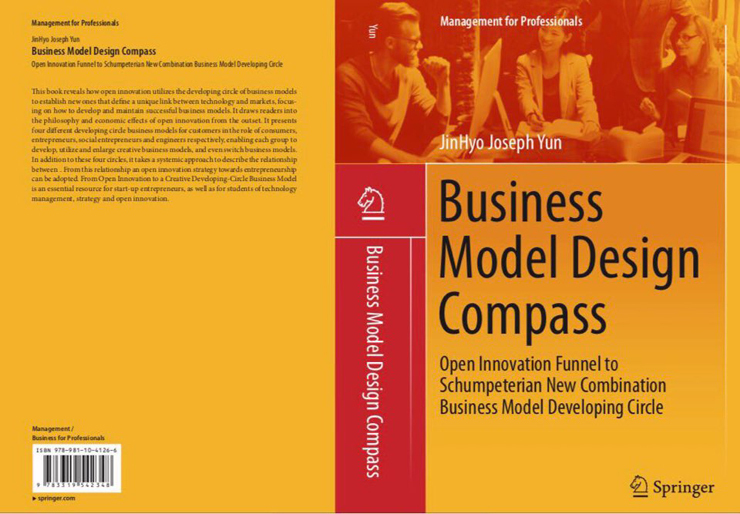 This book reveals how open innovation utilizes the developing circle of business models to establish new ones that define a unique link between technology and markets, focusing on how to develop and maintain successful business models. It draws readers into the philosophy and economic effects of open innovation from the outset. It presents four different developing circle business models for customers in the role of consumers, entrepreneurs, social entrepreneurs and engineers respectively, enabling each group to develop, utilize and enlarge creative business models, and even switch business models. In addition to these four circles, it takes a systemic approach to describe the relationship between open innovation, and business model. From this relationship an open innovation strategy towards entrepreneurship can be adopted. From Open Innovation to a Creative Developing-Circle Business Model is an essential resource for start-up entrepreneurs, as well as for students of technology management, strategy and open innovation. Eminent scholars such as Distinguished Professor Loet Leydesdorff who is the pioneer of the Tiple-Helix, collaboration among the industry, university, and government, Distinguished Professor Ulrich Witt who is worldwide famous for Schumpeter economic theory, Distinguished professor Anil K. Gupta who is the founder of the Honey Bee Network which is world best social open innovation platform, Professor Fred Philips who is the Editor In Chief of Technological Forecasting and Social Change, Professor KongRae Lee who is the founder of Asia Journal of Technology Innovation, Professor Venni Krishna who is the editor in chief of Science, Technology, and Society, and Professor Yigltcanlar Tan who is the editor in chief of International Journal of Knowledge Based Development congratulated and recommended the publishing of this book. Currently, Dr. Yun serves as the president of Society of Open Innovation: Technology, Market, and Complexity (SOItmC www.openinnovationtmc.org ) and plays a critical role in developing open innovation business model. More than 1,000 scholars from 30 countries are member of SOItmC. He is also the editor in chief of the editorial board of the Journal of Open Innovation: Technology, Market, and Complexity (JOItmC www.jopeninnovation.com ). More than 100 scholars from about 20 leading universities including Tokyo University, Tsinghua University, and the University of Cambridge are on the editorial board. Dr. Yun said, “The business model development based on open innovation will be very crucial to Korea in which not many research are underway in this field as well as to the world in the face of the fourth industrial revolution. I hope this book will provide clues for entrepreneurs, students, and corporation, and policymakers to respond to the new industrial environment.” Springer is the one of the prestigious global publishing company in Germany that publish books, e-books, and peer-reviewed journals in science, technical, and medical fields. More than 200 Nobel laureates’ books and journals have been published in Springer.